University of British Columbia researchers have found younger groups of organisms, on average, accumulate diversity much more quickly than older groups. Whales appear to be far past their evolutionary prime. 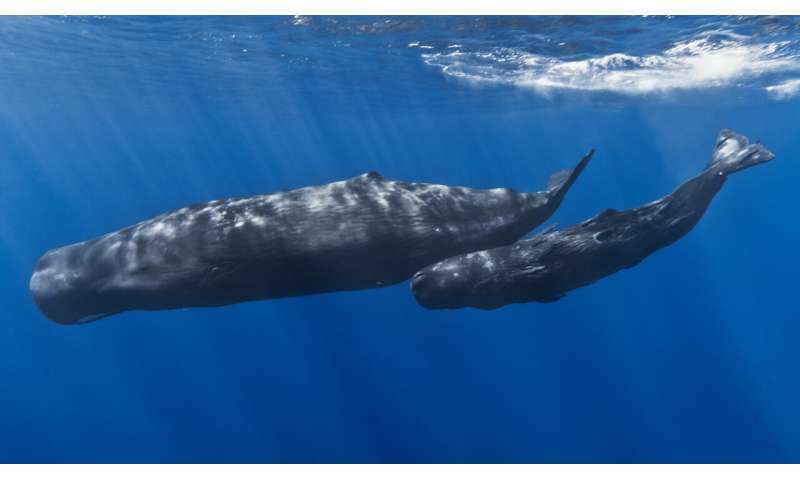 Credit: A mother sperm whale and her calf off the coast of Mauritius. Gabriel Barathieu, Wikipedia. It's a question that has captivated naturalists for centuries: Why have some groups of organisms enjoyed incredibly diversity—like fish, birds, insects—while others have contained only a few species—like humans. Researchers trying to explain why the Tree of Life is so unbalanced have agreed on a few explanations—a species' ability to change colour, its body size, and how it interacts with its environment all influence how quickly it can form new species compared to other organisms. Geological age has also been a major explanation—older groups of organisms have had more time to accumulate more species. But new research in the Proceedings of the National Academy of Sciences shows the passage of time has a surprising, and consistent impact on evolutionary diversity—and might favour young species. "If you look at rates of macroevolutionary diversification across 3.8 billion years, it's younger groups of organisms, on average, that accumulate diversity much more quickly than older groups," says Matthew Pennell, an evolutionary biologist at the University of British Columbia and senior author on the paper. "This suggest that there are some time-dependant, hidden general principles governing how life diversifies on Earth—operating underneath all the other factors we typically think determine how quickly species diversify or go extinct." The researchers estimated specification and extinction rates across almost 25,000 branches of multicellular organisms, using data from studies of over 100 groups of species and an independent data set of fossil time series. That enabled them to compare rates of diversification broadly over time. For example cichlids (a species of fish) from African rift lakes are diversifying incredibly fast, while whales are an example of a group that appear to be far past their prime in terms of diversity. "If groups of species were simply reaching equilibrium and slowing down over time, we'd expect a more consistent pattern of slowing within every group we look at," says Pennell. "But our results aren't showing that." When the researchers looked at individual groups, rates of diversification varied dramatically. What they did find at the macro-level was a strong pattern of faster growth of diversity in younger groups of species. "This really throws a wrench in how we interpret how life diversified on Earth," says Pennell. Evolutionary biologists have tended to look at particular features that have helped particular groups of animals diversify—or not. "The far less explored, and potentially more interesting question, is why, despite all the complexity involved in the evolution of new species, that process looks so similar across the Tree of Life."